Though far from finished, this past week has seen Dean and I tackle our front garden. 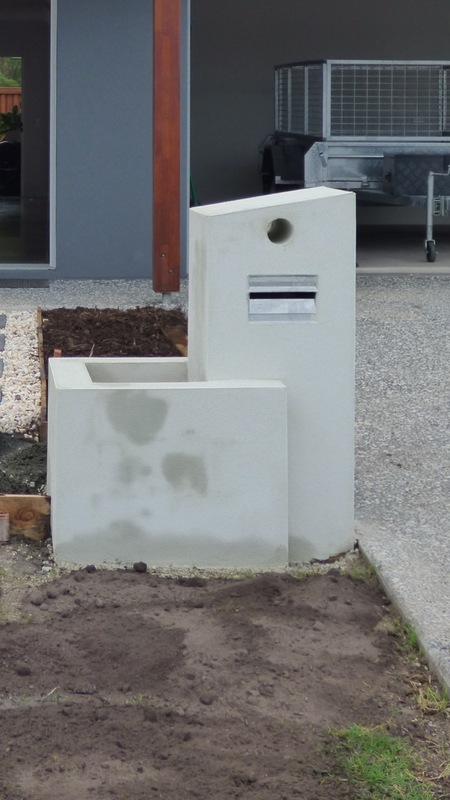 After some careful thought, and a little negotiation, we said yes to a rendered letterbox with a surrounding planter box. I wasn’t home at the time of construction. This was a big thing for me. It has always been my job to keep my finger(s) on the pulse, so to speak. But I needn’t have worried. Fixing the newspaper ‘tube’ in place. Applying the first coat of render. Kevin did an amazing job, both with shirt on and (later) with shirt off. Courtesy of my dear friend Denise, I’ve got a lovely piece of Jade (to match the name of our street) that I can’t wait to plant in that planter box. 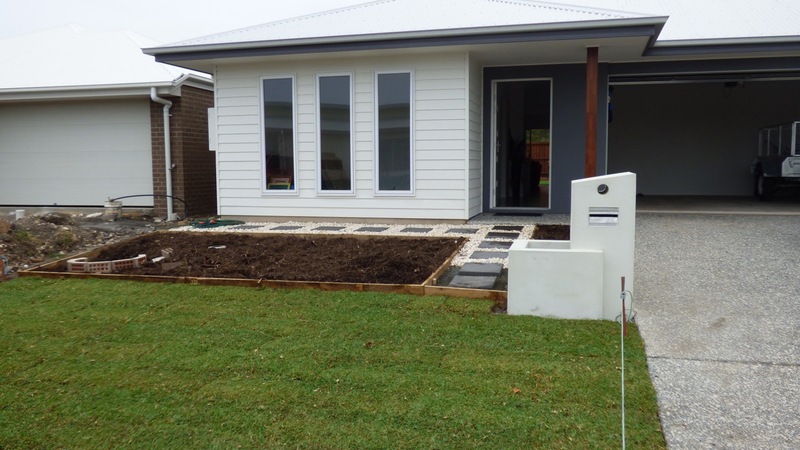 While the first coat of render dried, and before Kevin returned to do the second coat, we got stuck into the front garden. We laid a few pavers, bordered a couple of garden beds, threw down a few rocks, and waited for Kevin’s return. Just a few pavers and rocks. This will look wonderful when it’s finished. I love this leading to the door. What a difference that second coat of render made to the letterbox. It’s currently the best letterbox in the street (ha, ha). I think our ‘Taj Ma-Mail’ looks amazing and it will look incredible by the time it’s painted to match the colour scheme of the house and our street number is finally attached. And it works, the postie has already started using it. As soon as I returned though, this time we hitched up the trailer and headed down the highway to collect the turf as opposed to having it delivered. It did save us the delivery fee, but not double handling. When we arrived at the turf farm all the forklifts were off site (in trucks making deliveries) and we had to load the turf into the trailer by hand. Letterbox, pavers, rocks, garden beds and lawn – Wow! But . . . as stunning as the front garden looks, this doesn’t even compare to the total transformation one plant made a couple of hours later. Thank you for the beautiful Yucca Muriel. Now all we have to do is get it planted and surround it with more plants. One step at a time, we are getting there. Finally, once again, I have to thank Mother Nature for turning on the sprinklers last night and giving the lawn a good soaking. Sometimes I get my timing just right. Next Post Is it Greener on the Other Side? Wow… You guys are moving right along there. You’ve done so much in such a short time. It’s just gorgeous. Front garden… Flowers or veggies? Job updates? Hi Calen. The front garden will contain flowers, flowering shrubs, (small) palms and a few Yuccas (because I’ve now received another two from my dear friend Denise. Today I might just tackle painting that letterbox and then I’ll post some more photos. I must admit, I’m thrilled with the results so far, and the grass in the back garden is looking wonderful.